General astronomy comments or things you should know about. I think it’d be a good idea to explain my absence over the last three months, I feel suitably contrite. Summer isn’t a great time for UK observers as the Sun stays in the sky far too long, and never dips all that far below the horizon. Worse yet, as noted in my last post, we’re due a Solar minimum, and frankly the Sun’s been behaving that way. There have been a few interesting spots, but mostly when it was cloudy. This year I decided to take summer break from astronomy in June and July and do other things. Woodworking and printing are a couple of other interests and they work best during the day, which gave me a refreshing opportunity to enjoy some sensible sleeping patterns. I suspect this will become a regular event. We had a sweltering Summer this year with lots of clear days that were sadly lacking in darkness. It was much too hot for solar observing, so it came as a comfort that the Sun was taking time out too. The late Summer and into Autumn is a favourite time for me, as the dark nights return they bring the Milky Way, and the nights are comfortably warm too: T-shirt stargazing. I planned to resume observing in August, unfortunately the weather had different ideas. I’ve managed a few sessions, including some deep-sky and spotting a comet, but the hazy skies of late August have given way to flat cloud through almost all of September. That’s been the story here in the Midlands of the UK: a hot clear Summer and cloud since then. There’s not been much astronomy going on. All I can do is hope for better as we move into October. At least it’ll bring the end of British Summer Time (BST). I managed to find this comet quite easily as a large fuzzy dot with my 10×50 binoculars on the 3rd August 2014 when it was south of eta Aurigae. Visually I couldn’t see a tail, but I’ve been informed that one appears on images. It was around magnitude 6–7, so quite bright, and it’s moving towards Perseus, fading as it goes. Here’s a chart (Carte du Ciel again) to help you find it (click on it for a larger view). Each point on the path is at 23:00 on the day indicated, when it should be clear of the eastern horizon. 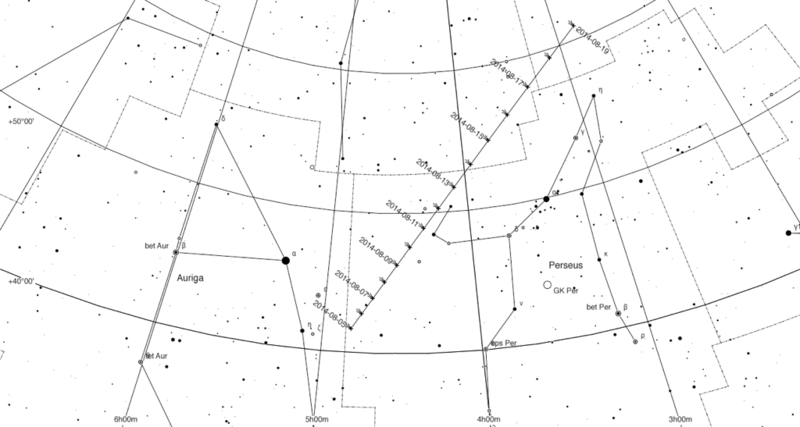 Auriga and Perseus are distinctive constellations that show up even in light polluted skies. I’d recommend making the effort to see this comet as we don’t get many in the northern hemisphere within range of binocular astronomers. My name is James Whinfrey and I’m in my third year of amateur astronomy in the UK where it’s wet and cloudy. I’m not sure why I started, other than the first BBC Stargazing Live, but I’m very glad I did, and I’m hoping I can convince others to have a go too. I’ve progressed from clueless staring into an eye piece to moderately more-knowledge-than-none and a member of several organisations including a local astro society in Northampton. I love observing double and variable stars – of which I regularly submit observations – and I’ve several new projects lined up for this year. And for a first post my choice of title tells the story.